Ayutthaya Bus Station was 5 minute walk from our guest house. 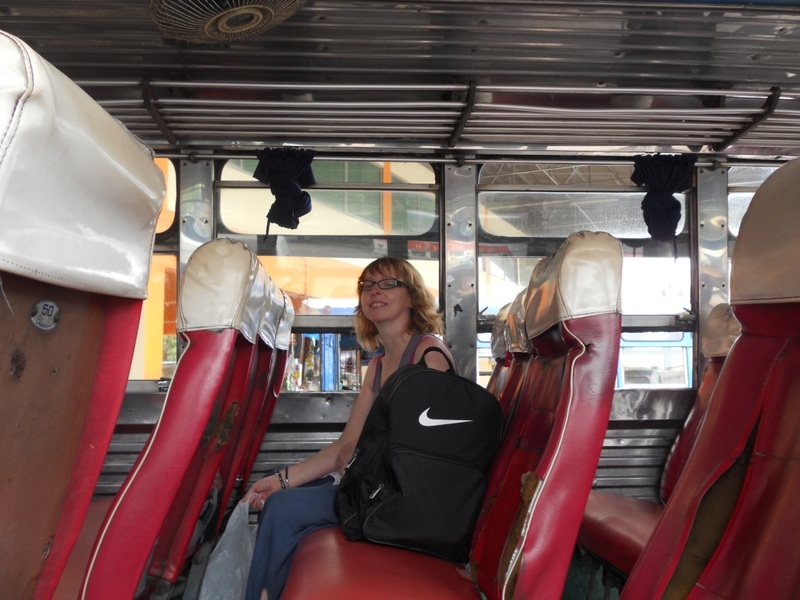 Walking through the street, we were advised that an air-conditioned mini bus would be 380 Bhat each. The problem with this, notwithstanding the price which we knew was ludicrous, is that you kind of feel you are cheating when taking the easy option. The bus will be full of well healed travellers’, in relative terms, and you are not really experiencing transport as utilised by the locals. There are lots of dogs in the streets, mostly lazing about in the shade. One jumped up startled as we walked up the road, and I practically shat my pants and jumped about 4 feet in the air as he barked loudly and went straight for my leg. Turned out, the dog wasn’t really being aggressive, he just got a fright, but he still managed to playfully toy bite my calf. I immediately got out of the way, and at a safe distance, checked to see if the skin was broken. It wasn’t, and I didn’t start foaming at the mouth 24 hours later either, so safe to say no rabies on this occasion. Got a bit of a fright though, and it was a good reminder to keep your wits about you. It transpired that for 80 Bhat, a small local mini bus would take us to Suphanburi Bus Station, about half way, where we could then get the coach to Kanchanaburi for a further 50 Bhat. This represented a total saving of 10 quid for the two of us, and travelling this way was just as hassle free, albeit a slightly longer journey time of maybe an hour or so. From the Bus Station in Kanchanburi, we took a local pick up for 10 Bhat, crammed in the back with curious friendly locals, and dropped off 10 minutes later at Dam Rak, the war cemetery. This was just around the corner from the area we wished to stay in, and we found a nice hotel for about 250 Bhat on the main drag. This street is geared for the tourists that are daytripping from Bangkok to see the River Kwai Bridge, so there was plenty eateries and bars showing the weekend football. So we took a stroll one day along the street towards the bridge and I can just hear Dad saying “Eh’ve been there!” The bridge was a lot smaller than I thought it would be, maybe the famous film had given me this impression, and wasn’t the bridge blown up by Obi Wan Kenobi anyway? 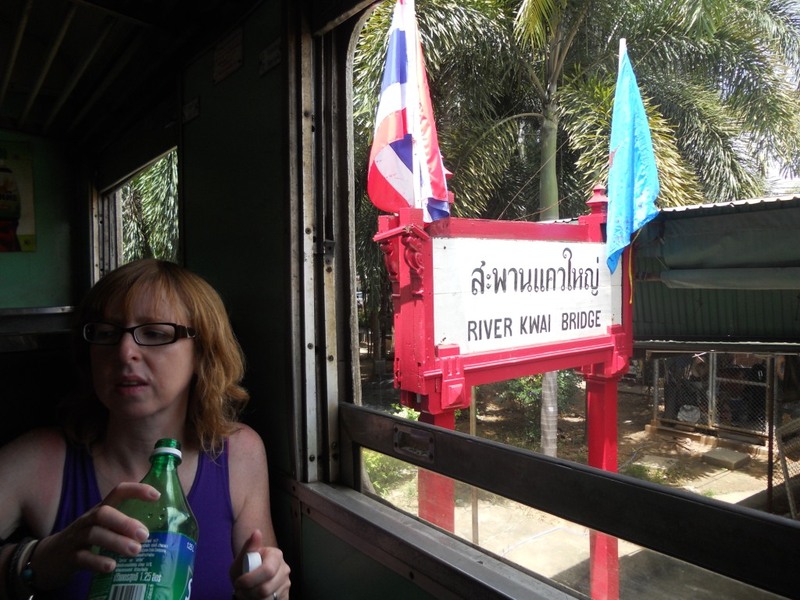 We decided, rather than hang about Kanchanaburi, we would take the train over the bridge and head to Nam Tok. 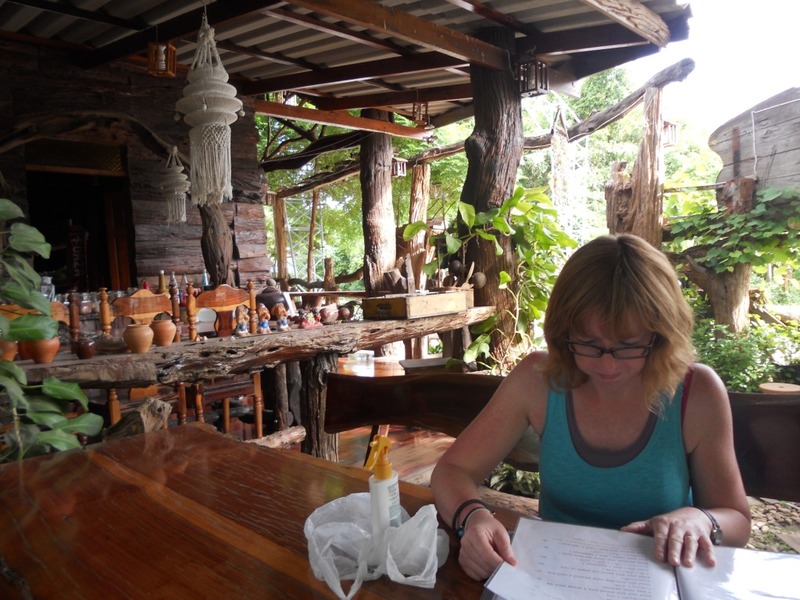 There was a wee man from Nam Tok … no, we had to stop repeating this and each time giggling like school children, wondering who would dare to come up with the next line. 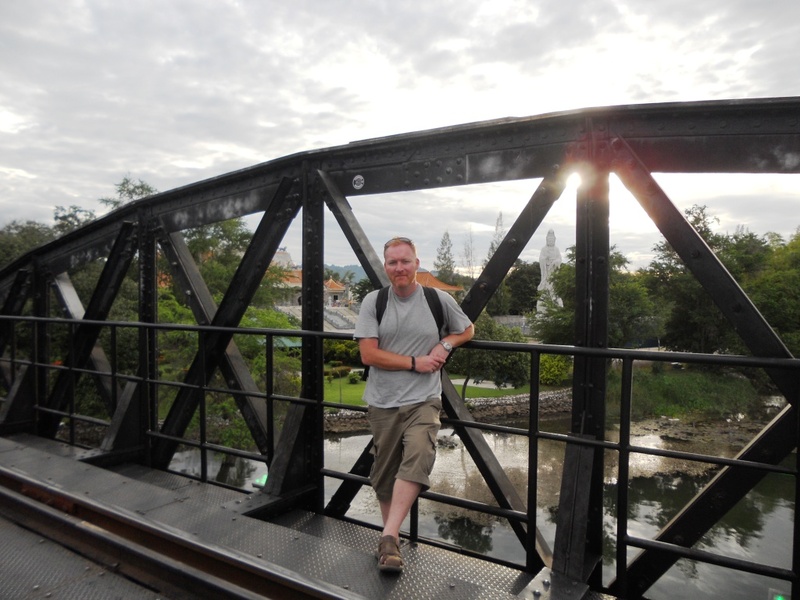 The train journey was quite pleasant, taking around 3 hours, and creeping over the old bridge, before gathering speed as the rural countryside flew past. All the windows were open, allowing a refreshing breeze. The train would reach the Death Valley Viaduct, and slow down to a snails pace as we crept along the creaking wooden construction, hoping it could hold the weight of the train. It was a long way down, and the huge chocolate coloured river was lurking at the bottom. Fortunately, both Michelle and I had forgotten to pack our thong and speedo’s, so we headed down the road to find accommodation for the night. 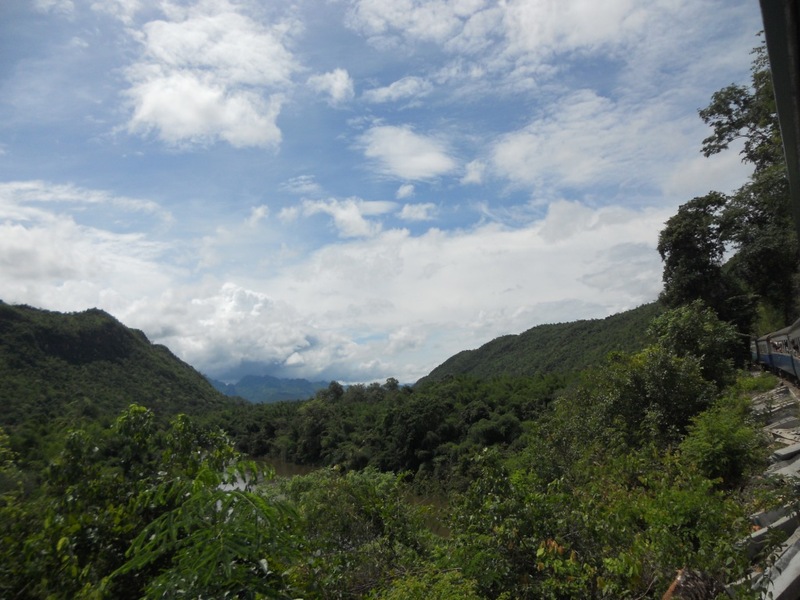 We first sat in a restaurant for something to eat and a couple of beers, taking in the view of the spectacular large green mountain range separating Thailand from Myanmar. To think we were so close to the border and both our thoughts went back to the great times we had in that wonderful part of the world. We were at first offered a bamboo hut for 250 Bhat. We had a look, and could tell neither of us was particularly impressed. Staying the night in a shed was not very appealing, so we crossed the road and found this resort type place, where we were offered a chalet type bungalow, in a peaceful rural setting with beautiful manicured gardens. With it being low season, we more or less had the whole place to ourselves. There was not much to do other than chill for a night. 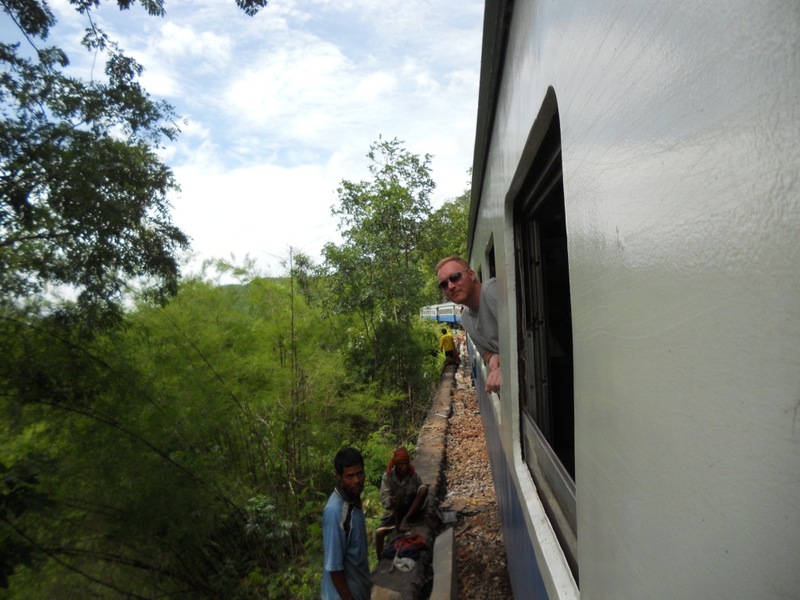 On this occasion, the journey was the attraction, and we decided that as we were paying 100 Bhat each just to get on the train, we may as well continue all the way back to Bangkok, where we could plan how we were getting to Laos. I’m now the one being slaughtered at Chess by the Lochee Grandmaster by the way.